Denver’s RiNo Art District is in the midst of one of the biggest construction booms the city has ever seen. How will local leaders preserve its creative roots as quirky and industrial morphs into chic and mixed-use? River North, late 1990s. On Brighton Boulevard, nobody knew the area by that name, but they soon will. A new era was about to dawn on this patchwork of urban oblivion. The frayed industrial environment, one part tumbleweeds and two parts railroad tracks, spoke to the creatives who start turning old garages and abandoned buildings into workspaces. Mickey Zeppelin launched his mixed-use TAXI project at the dilapidated old Yellow Cab depot in 2000 and graphic designers and tech startups started populating River North, a moniker soon shortened to RiNo. 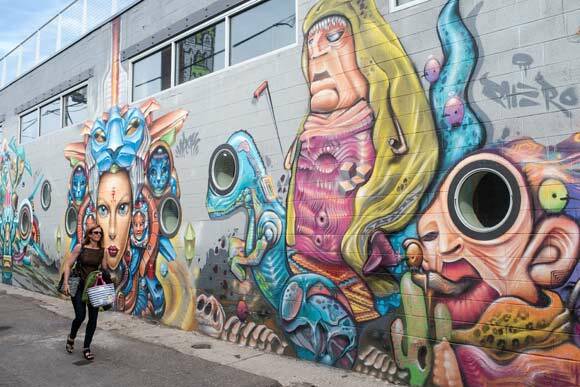 As it bloomed, artists established the RiNo Art District in 2005. The vast area provided a frowzy counterpoint to the redbrick majesty of the city’s other disyllabic comeback neighborhood, LoDo. It was gritty and interesting, with the South Platte River running through it, full of vacant lots and vast swaths of junkyard — and just a couple miles northeast of downtown Denver. RiNo was both a perfect environment for artists and other creatives, and a massive real-estate opportunity. The possibilities were endless. Now, they’re less so, or at least they’re different. The blank slate is quickly filling in with hundreds of millions of dollars in new development. But the creatives who kickstarted the boom a decade ago continue to shape the vision for the area, and that vision emphasizes building on the neighborhood’s artistic foundation. The big question: How do you sustain the arts in RiNo as it transmutes into something new? One answer: tax yourself. The RiNo Art District was the force behind the campaign for a business improvement district (BID) and complementary general improvement district (GID), complete with the tagline, “Keep RiNo Wild.” Both districts were officially established in late 2015. Since RiNo’s certification as a Creative District by Colorado Creative Industries (CCI) in 2014, change has come fast and furious. Jamie Licko, president of the RiNo Art District, says CCI certification served as a “huge catalyst” at a crucial time. “A big push has been to take advantage of the opportunity we had by being organized early in the development of the neighborhood,” she says. Resources are coming to bear: The combined budget of the BID, GID, and RiNo Art District was about $1.3 million in 2016, and Licko expects that number to increase to about $1.9 million in 2017 followed by a “bigger jump” in 2018. Mural by Pher01, MPek and Brian Scott Hampton at 1360 27th St.